What If We Designed a Building the Same Way as an iPhone? The most promising technologies of today (and especially tomorrow) are those that live with us and adapt to our needs. Smart phones are one of the most compelling example of this. Every connection, daily need, and data point is now at our fingertips. So — if we can evolve this far beyond the rotary dial phone of 50 years ago — why can’t buildings adapt to their users instead of the other way around? New examples of technology in buildings and construction are everywhere these days. The vast majority are point solutions — looking to automate small slices of our home life or digitize and streamline aspects of the building process. These are necessary and valuable tasks, but they don’t solve the issue of improving the building user interface. Furthermore, they are not adequately addressing the larger set of economic and social pressures facing the building industry today. Technologizing the built environment is imperative in order to meet growing housing demands at affordable cost. How can we meet this challenge in a revolutionary way as opposed to the incremental approach the industry is taking? One concept that has gained recent traction in both the media and throughout the building world is the idea of developing a building using similar methods to an iPhone. A provocative idea — but is it feasible? I, for one, believe it is absolutely within our grasp. To understand how we would approach this, let’s first ask: what makes the iPhone product so user friendly? Firstly, there is a huge opportunity for customization. iPhone apps provide unlimited ability to personalize the device to a user’s needs. Further, an iPhone’s value doesn’t end with the device itself. There is a large investment in developing compatible, interoperable hardware and software, with deep attention to the interface and user experience. Lastly, the device hardware is designed and engineered in such a way to be mass produced, available to anyone with the interest and means to procure one. Its cost gets lower as demand increases. Traditional buildings lack many of these features. They are essentially uniquely designed static objects. Any updates are custom to that building and require a heavy investment of time and resources. User experience is often an afterthought. Decisions on design and engineering are most often driven by first cost, construction time in the field and regulatory constraints. Building systems for instance, such as electrical and mechanical systems, are developed with the goal of meeting the minimal standards of building codes, rather than aiming to improve the interface and experience of building managers or occupants. 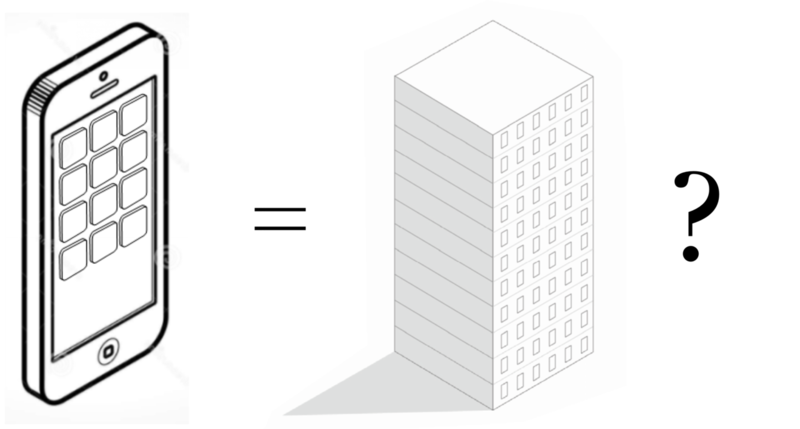 Lastly, large-scale buildings are almost exclusively one-off prototypes. Rather than thinking of them as repeatable, manufacture-able products, they are designed to pre-determined specifications of developers and the nuances of specific project sites, constructed one piece at a time onsite. This is quite a delta between a building and an iPhone, to say the least. In order to bridge this gap, we need to shift our mindset to rethink everything about how we design, engineer, and assemble buildings. We need to make buildings highly customizable and adaptive, with new features and components easily changed over time. We must invest in design solutions that optimize the interface between the building and its occupants. And we need to design buildings to be highly manufacture-able, leveraging economies of scale in a high-quality factory environment. The answer is a new kind of system, more closely mirroring the relationship of software and hardware — a BOS (Building Operating System). Thinking about an apartment, condo, hotel room, or dorm room as an App unlocks a world of new opportunities. An App product is separate from the core building structure and can be easily replaceable and upgradeable at any time. Multiple modules could be combined or divided, providing larger open plan spaces and the ability for quick and dynamic configurability. Like a huge Rubik’s cube in which you own air rights and not floor space allowing expansion and contraction over the lifetime of ownership. Utilizing a factory environment and logistics analysis, the Apps could be optimized for ease of shipping and installation and removed or replaced in hours to create a secondary market for Apps. Retrofits or refurbishments to existing spaces — recycling or reusing parts of retired modules — is now much easier and drastically faster, with no mess or waste. The beauty of such an approach is that both owner and consumer choice is unlimited. Much like a phone case or device shell, this modular system could work with any number of structural framing materials. The building façade can still support custom detailing, like a home screen image of choice. MEP systems now become a standard kit of parts like a microchip. The upshot is a better, faster, cheaper way to approach building development, assembly, and occupancy. Some will almost certainly read this and pick at the logic I’ve outlined. Many would have also scoffed at a 50-story skyscraper built in under 3 weeks — until someone actually did it. The point is that buildings are unbelievably ripe for innovation. We need bigger and bolder ideas. The social and environmental impact is too important to continue on as we have — as an industry that continues to fall in productivity and contribute at disproportionate levels to landfills and CO2 emissions. If you’re interested in joining me on this mission, I encourage you to learn more about Katerra. We are building a world-class talent group to explore ideas exactly like this. We need the best engineering minds in the world dedicated to improving the structures and cities where we live our lives, and, more importantly, where future generations will live theirs. Originally published by Steve Burrows on April 10, 2018.